The culture that made military shooter video games popular and key in understanding the War on Terror. No video game genre has been more popular or more lucrative in recent years than the “military shooter.” Franchises such as Call of Duty, Battlefield, and those bearing Tom Clancy’s name turn over billions of dollars annually by promising to immerse players in historic and near-future battles, converting the reality of contemporary conflicts into playable, experiences. In the aftermath of 9/11, these games transformed a national crisis into fantastic and profitable adventures, where seemingly powerless spectators became solutions to these virtual Wars on Terror. Playing War provides a cultural framework for understanding the popularity of military-themed video games and their significance in the ongoing War on Terror. Matthew Payne examines post-9/11 shooter-style game design as well as gaming strategies to expose how these practices perpetuate and challenge reigning political beliefs about America’s military prowess and combat policies. Far from offering simplistic escapist pleasures, these post-9/11 shooters draw on a range of nationalist mythologies, positioning the player as the virtual hero at every level. 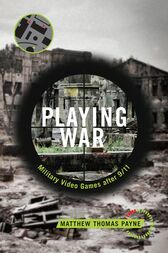 Through close readings of key games, analyses of marketing materials, and participant observations of the war gaming community, Playing War examines an industry mobilizing anxieties about terrorism and invasion to craft immersive titles that transform international strife into interactive fun.